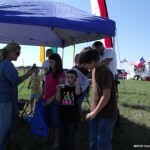 The 3rd annual Kites Over Granbury kite festival was held in Granbury, TX this past Oct 17th-18th. 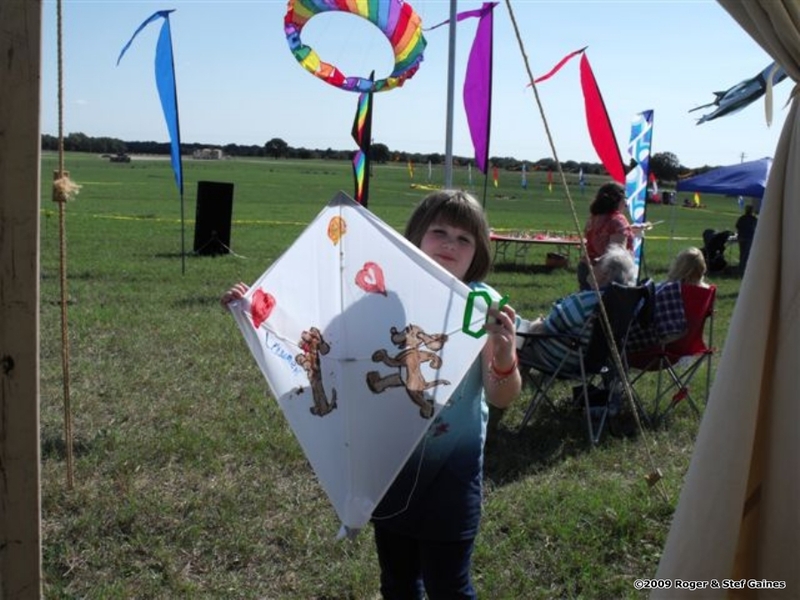 Stef and Roger Gaines, owners of Family Fun Kites in Granbury, organized the event, with mucho assistance from Dallas Oliver (member of the Dallas Area Kitefliers Association (DAKO) and all-around good guy). 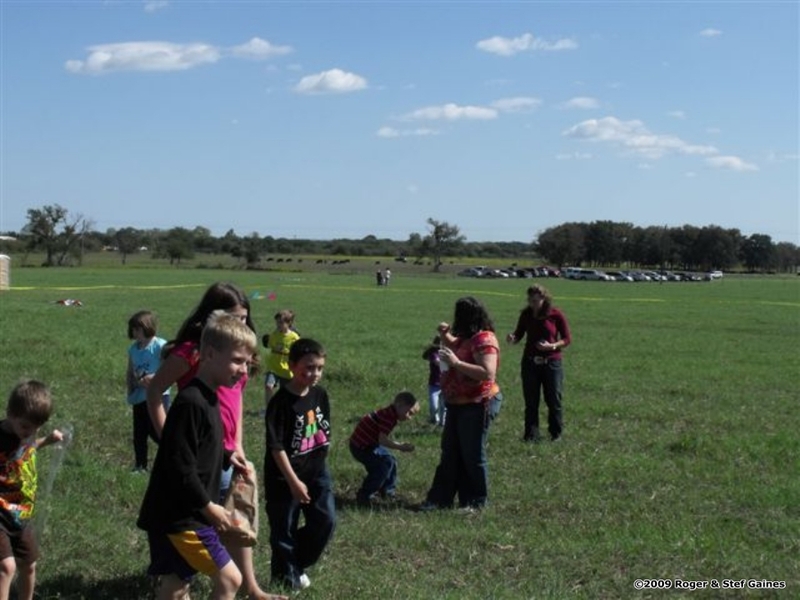 The event, held every third weekend of October, benefits the Child’s Advocacy Center of Hood and Somervell Counties to help Kids In Crisis. 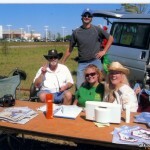 Helping make this festival move along: Stef and Roger Gaines, Dallas And Donna Oliver from Arlington, TX; Brent and Melissa Sutherland of Goldthwaite, TX; Gayle Woodul, AKA region 8 director; Cassie Shook from New Tech Kites in Austin, TX; Troy Gunn from Wichita Falls, TX, team Austin EOL out of Austin, TX (Eddie Zihlman, Jim Cox, Michael Boswell, and Ben Gray); Deontae Boswell (Michael Boswell’s son, and the youngest sponsored kite pilot that I know); Some of us had our family, or part of family, attend with us. 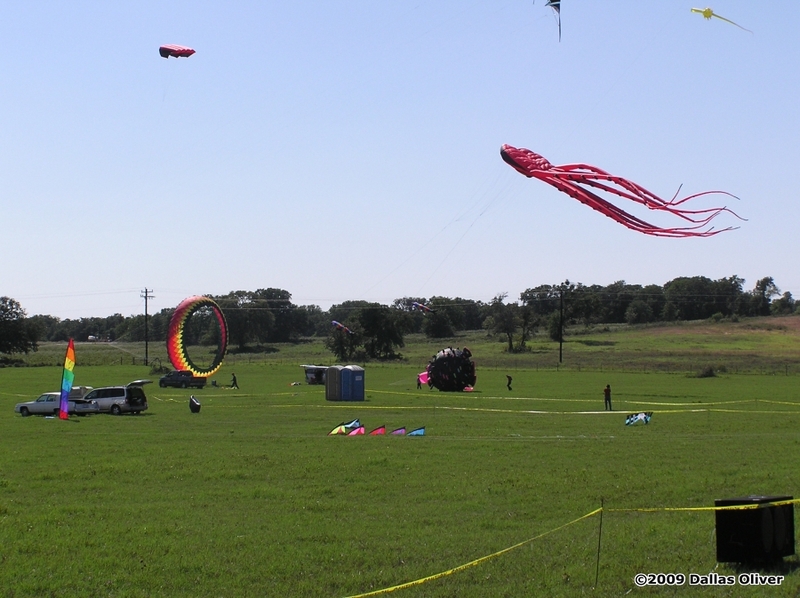 Whatakite, from Lufkin, TX (owned by Barry Ogletree) was on hand to fly their giant kites. Melissa was the announcer de jour for both days, and did a fantastic job in keeping activities moving along, keeping the music going, and keeping the public informed. And last but definitely not least, Jerry Durant for providing the field. 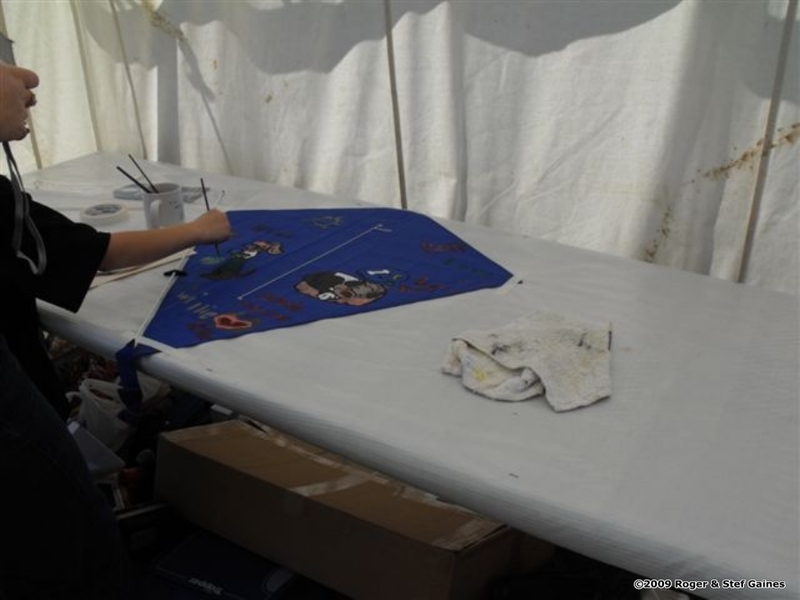 As with any kite festival there are a number of folks that work hard setting things up, helping the little and big kids with assembling and flying the kites the won in the raffles or bought. I can’t remember all of them, but you know who you are and “Thank You!” for all of your help. The wind was coming in from the north on Saturday, and was light and very fickle. But we were there to fly, and fly we did! 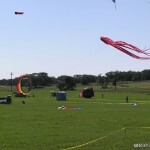 Austin EOL flew their Skyburner Pro Dancer SULs all day. 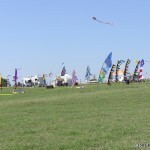 The Whatakite team definitely had their job cut out for them, and their expertise with the giant inflatables was certainly evident in keeping the big kites up as best they could in the almost non-existent wind. 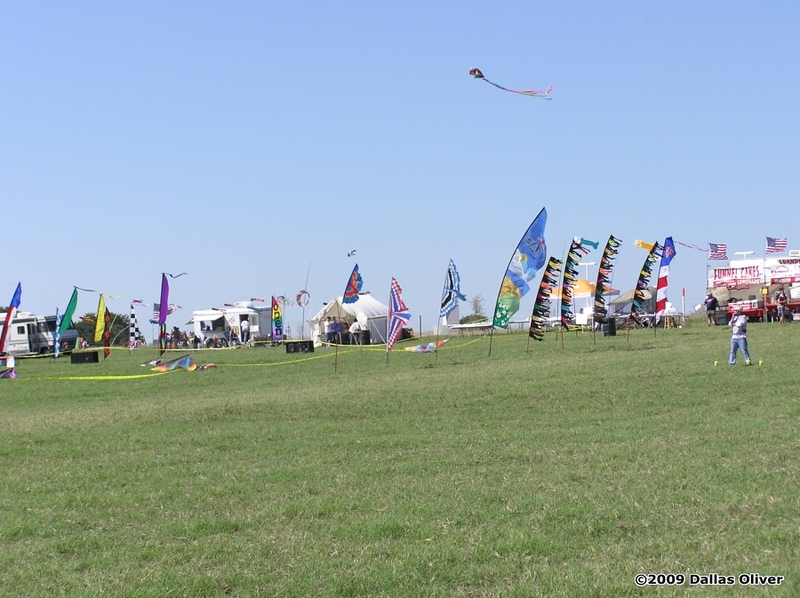 And the people came, and watched, and flew kites, and had a good time. It’s funny- we spend untold amounts of money on high tech kites (sometimes to the dismay of our spouse), years of practice going into mastering them, and the kid with the $3 Gayla kite just puts his kite in the air and enjoys life. Maybe that’s a lesson for all of us- don’t forget the basics of what we’re doing- we love to put pretty flying things in the air because it’s fun! Family Fun Kites had a shop set up, as did several food vendors. 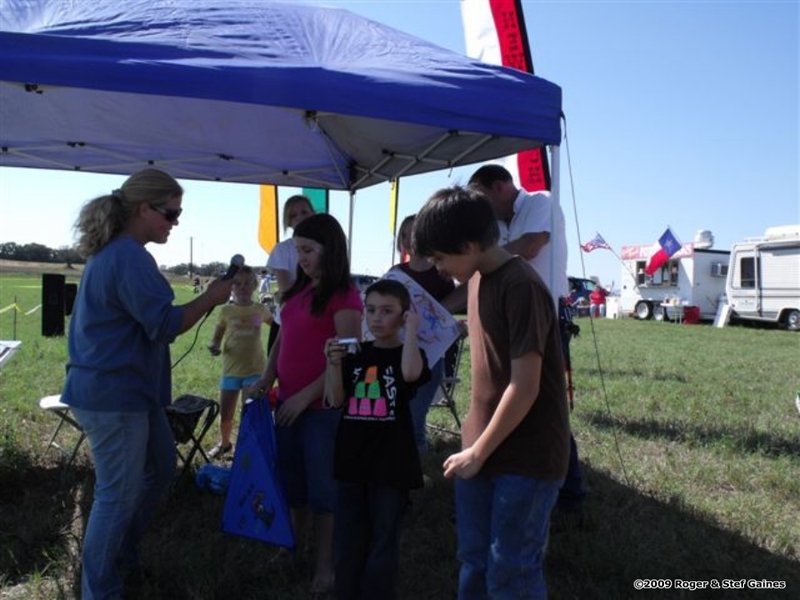 Gayle Woodul had the AKA information table set up, and all of the AKA registered pilots attending were answering questions to the public about the AKA and kiting in general. 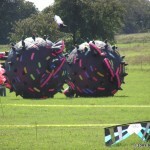 Cassie Shook was representing New Tech Kites in fine form, as was Deontae Boswell. 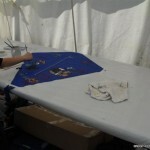 Both of them were out in the public fly field helping people to learn to fly, dual line as well as single line kites. 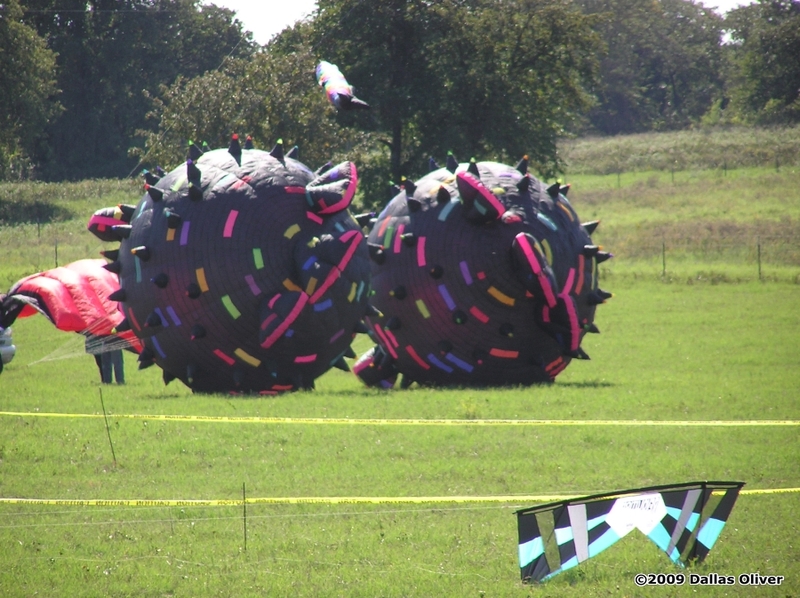 Bol races were held, as well as a candy chase- ok, it was supposed to be a candy drop, but the wind didn’t want to cooperate. 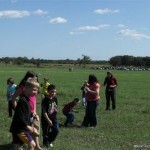 So grab a bag of candy, get into a golf cart, and have the kids chase you! LOL, ok, it was done safely, much safer than I just described it. 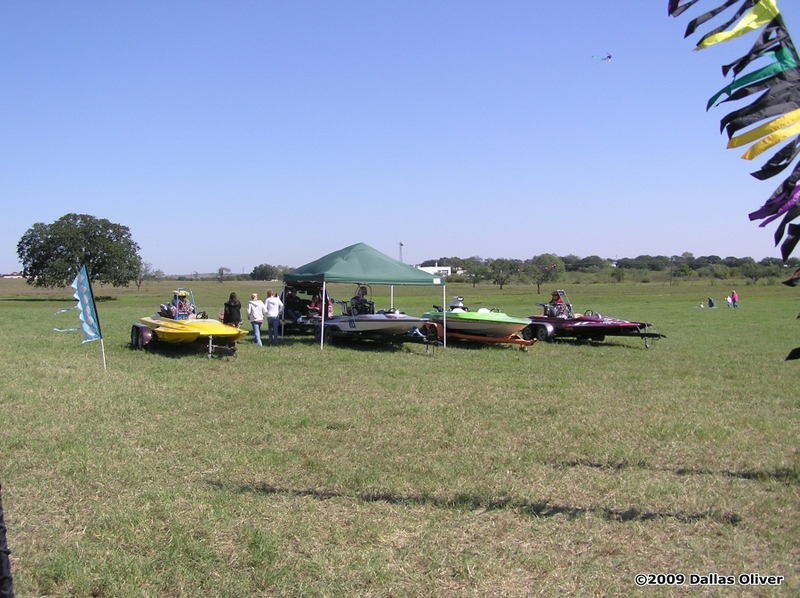 By late Saturday afternoon, the winds actually picked up a bit, and everyone had something in the air- Whatakite had a giant manta ray up, Austin EOL was able to fly team, Troy did a lot of Rev demos. 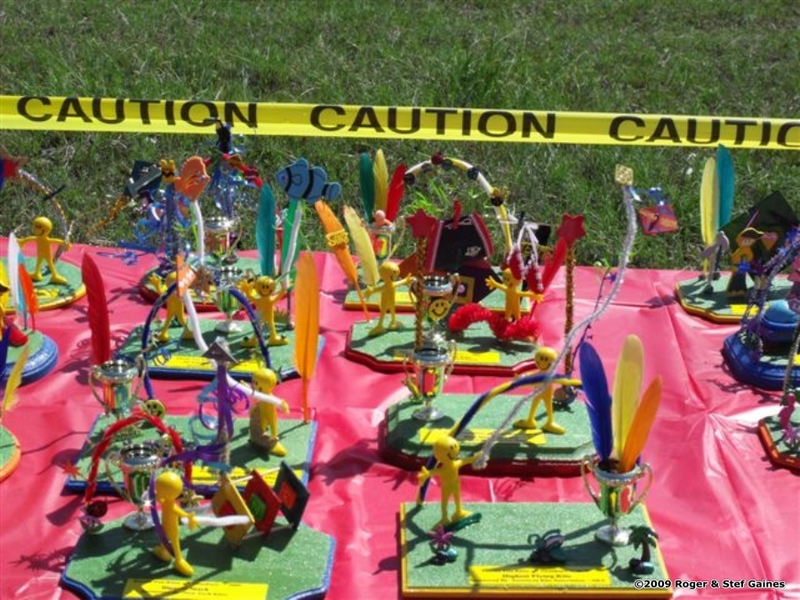 Other demos were flown as well- some by Hank Ketchum and Dallas Oliver. (Yeah, and that kid with the $3 Gala? Still flying). 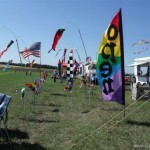 After the festival ended on Saturday, most of the kiters met at the courtyard of the host hotel, the Granbury Inn & Suites, for a “picnic” style dinner, which was catered by Stef Gaines mother (better known as “Mom”). The food was outstanding! It was a fun evening, just the kiters there enjoying each other’s companies and sharing stories. It was really great to sit and talk to a lot of people I hadn’t seen in well over a year. I appreciate how we can just sit down and pick up where we left off- the camaraderie is definitely a very special thing. The wind on Sunday was from the south, strong, steady, and it stayed that way all day long. 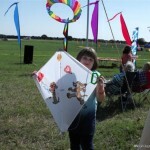 Big kites were being flown by Gayle and friends this time, since the Whatakite had to leave Sunday morning. More demos were flown by Austin EOL, Troy Gunn flew two dual lines by himself- and he had a guest star with him- Shane Snowden! Shane has been taking a break from team flying to work on his college degree. 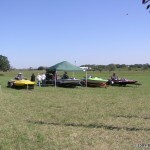 Shane does fly with team TKO on occasion, and was in Granbury to fly solo demos and fly pairs with Troy. They did an outstanding job. Austin EOL flew the “fishies” routine with their Sholtz dual line fish kites, which is always a lot of fun to fly and the crowd finds really entertaining. 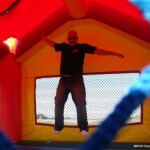 We were able to do a real candy drop as well, which the kids enjoyed. 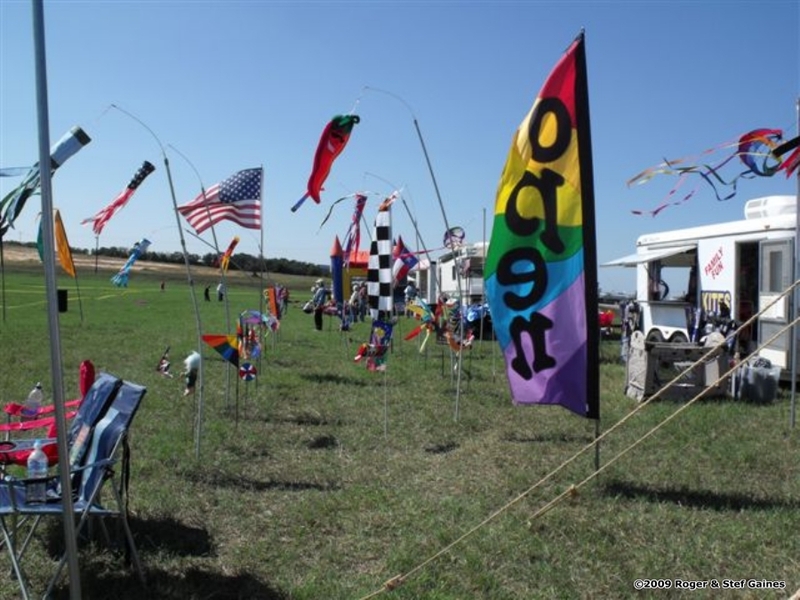 There were also kite competitions each day; highest flying, most unusual, smallest kite, oldest kiter, youngest kiter, who travelled the furthest, as well as raffle drawings for all sorts of prizes. 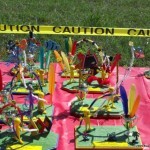 The trophies were unique creations by Stef Gaines, and were all very, very cool! The festival ended late Sunday afternoon- there were people still flying, but Nick and I had a long drive home ahead of us, so alas, we had to leave. 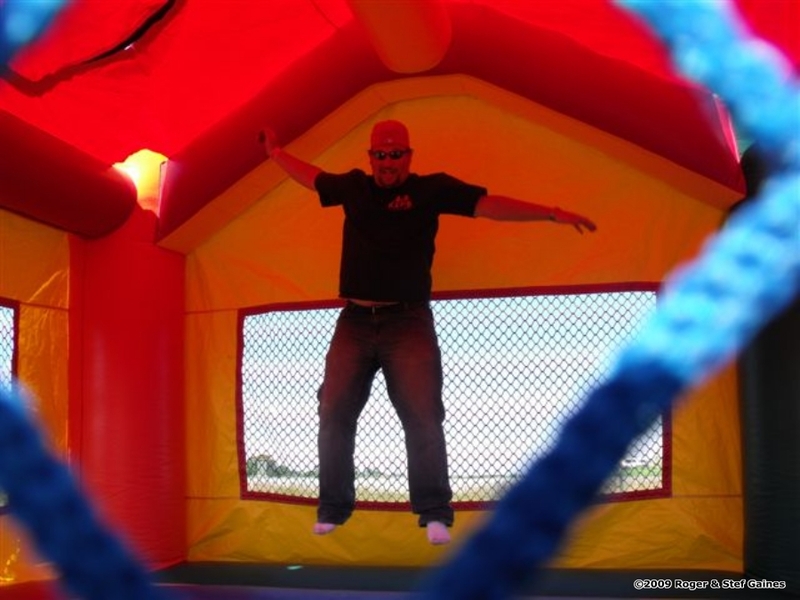 This was a fun event and we were glad we could be part of it. 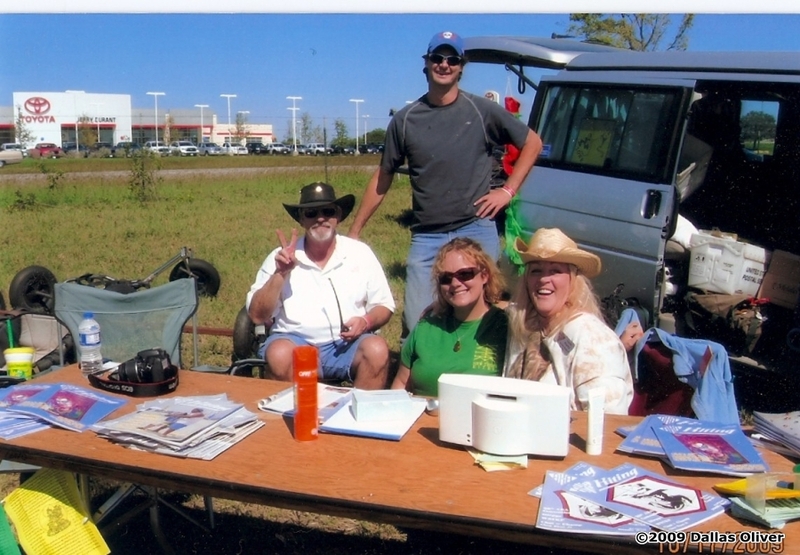 This entry was posted in 2009, Issue 69 (Nov/Dec), KL Archive and tagged festival, granbury, texas.